A funeral for two brothers who died when their car crashed on the M6 on Christmas Day has been attended by thousands of mourners. Adnan Habib, 10, and Mohammed Arsalaan Habib, four, were killed along with their aunt Bushra Tazarib, 32, close to junction 15, near Stoke-on-Trent. The funeral, also attended by boxer Amir Khan, was held at a mosque in High Wycombe, Buckinghamshire. Their aunt's body will be taken to Pakistan. More than 2,000 people attended the funeral for the brothers and hundreds spilled out into the street from the packed mosque and said funeral prayers in the pouring rain. Earlier in the morning, boxer Khan tweeted: "In Wycombe for the funeral of 2 young kids + aunty who died in a car crash on way to a cousin's wedding last week. Condolences to the family." Khan was at the same wedding the three crash victims were travelling to on Christmas Day and has described how the occasion turned from joyous to "despair" as news of the tragic accident spread. Before the funeral ceremony, the bodies of Adnan, Arsalaan and their aunt were laid in another mosque nearby, where grieving relatives, friends and members of the community paid their respects. Afterwards, the coffins were moved to the town's nearby main mosque where the funeral ceremony was held. 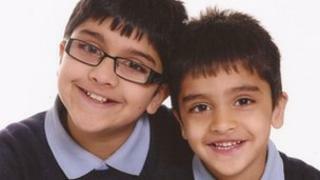 A private burial was due to take place for the two boys. An inquest into the three deaths has been opened and adjourned by North Staffordshire Coroner Ian Smith. In a touching tribute issued earlier, the family said: "Adnan and Arsalaan were our family's precious jewels, spreading joy wherever they went. "They were happy and joyous boys who were a central part of the family, always smiling and bringing smiles to everyone they met." Bushra Tazarib was described as "beloved", "helping" and "supportive". Two other women were travelling in the car that crashed, including the boys' mother, who was driving at the time, and were taken to hospital but discharged after treatment. All five in the car were from High Wycombe and had been travelling north on the M6 to attend a family wedding in Greater Manchester. The incident closed the motorway in both directions for three hours from junction 14 at Stafford to junction 15 at Stoke. The Central Motorway Police Group's collision investigation unit is continuing to examine what may have caused the crash, which is believed to have involved one vehicle.